The Datalogic R Series increases productivity through reduced errors during receiving, put-away, picking and shipping activities. Addition of a handheld barcode scanner allows for quick data entry and location confirmations. The R Series vehicle mounted computers set the industry rugged standard. The aluminium outer case with fan less design withstands the vibration and shocks experienced onboard rigid suspension vehicles. 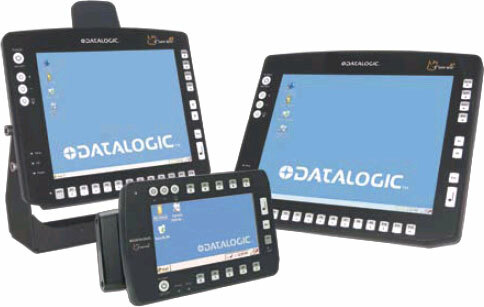 Exclusive 2-tail touch screen technology and mounting endures direct display abuse. IP sealed to the maximum extent, R Series resists dust, rain and harsh cleaners. A heater option protects the R Series in freezing temperatures. Available in three different sizes, R Series fits different mounting and space constraints. Mounting options include support for the vehicle mounted computer, handheld readers, ABCD or QWERTY external keyboards. A dedicated software keyboard with over 25 layouts (including 8 languages) adapts the R Series to a minimum footprint and global enterprises.